Your points are taken for making too many mistakes or being sloow (both total length of word, and intervals between individual letters). Warnings about those will appear near the top. When you press backspace, current word (not letter) is erased, and you can choose a different target. 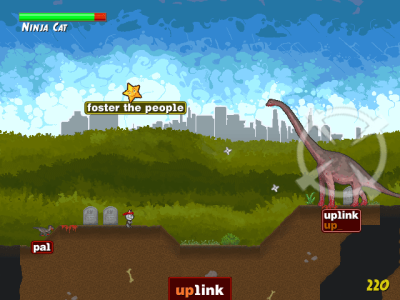 It’s very useful when you’re typing a long sentence, but the dino is far away (or you’re typing star), and you’re attacked much closer by different dinosaurs. Then press backspace and choose a new target. As one could assume from this kind of keyboard-centric game, in the menus you can do everything using keyboard. _underscores_ below letters show shortcuts. 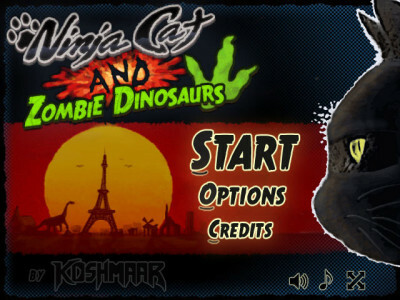 For example, press S to move to Start game menu (level choosing), press O for Options and C to go to Credits. After finishing level, on the statistics screen, press M to go to Menu, N for Next level, R to Restart the current one. Also, usually B, backspace or escape moves back (ie. from options or credits to main menu). The volumes in options can be changed with up/down arrow and page up/page down. Last but not least useful shortcut: in menu press 1, 2, 3, 4 or 5 to immediately start playing specific level. Play Ninja Cat daily, just one level at a time, and quickly you’ll discover how much better at typing you’ve become! If you finish the game, or it becomes too easy for you, choose in Options a higher difficulty: MEDIUM, then HARD. Hard is really funky, long words and even sentences for some regular dinosaurs, so don’t be surprised if you get overwhelmed. However, it’s totally possible to beat the whole game on hard. escape to pause the game. 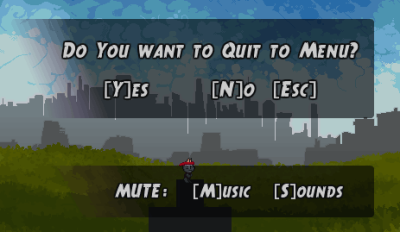 Menu appears where you can toggle the music or sounds, exit to main menu or resume game. Zombie Raptors are small dinos, deadly in close combat. Kill them fast at a distance. They can wall-jump and swim. Pteranodon – undead dinosaur which randomly attacks from the sky. He has a certain routine – first he flies horizontally, just looking at you. Then he suddenly attacks, and if he succeds, he comes back to his horizontal flying. Tip: if a pteranodon has already hit you, and you see other dinos closely attacking, then it’s better to kill them first, because for that one pteranodon it will be around 10 secs before he can hit you again. Triceratops is almost blind, expect attack only when you appear in front of him. But then… type like mad! They are used to attack by fallign behind you. Nothing more to add, Tric deals damage only once but it’s really much, so if you have to choose which type first between any other dino, in most cases I’d say: choose Triceratops first. Brachiosaurus is so heavy he can’t move. Brach spits gluey goo, which makes you stuck. Type it first! I’d say, after Triceratops, Brach has the higheest priority. Because if you’re standing still, raptors can really easily deal a lot of damage. So, usually: first type the spit, then Brachiosaurus, then other dinos. Tip: sometimes it might be useful to let the spit stop you, so that you’re standing in place for a few seconds, and ie. raptors from below (where you’re heading) won’t have access. It’s even better when you have Shield powerup, because then you won’t be damaged. Tyrannosaurus Rex – he’s the boss. You have to type a long sentence 7-10 times. He bites really hard, with full healh you can survive only 2 consecutive attacks; third and you’re dead. Fortunately if you type the sentence, he’ll be shocked and his nearest attack will be reset. You can see how close is he just by the distance between both of you. Also when the input box starts flashing, he’s going to attack in a few seconds. If you have a chance to type health powerup, do it – it gives you one more possibility to fail. They are collected either by typing them, or by touching them by Ninja Cat (sometimes, if you have luck). They appear on the left side of the screen. Health powerup heals 20 to 30 HP. Very usefull, but only if you have less than 100% health. Usually I’d even advice to wait until it goes under 90%, so that you can focus on killing dinos and preventing the need for taking the “medicine”. Score powerup doubles the points for kills. 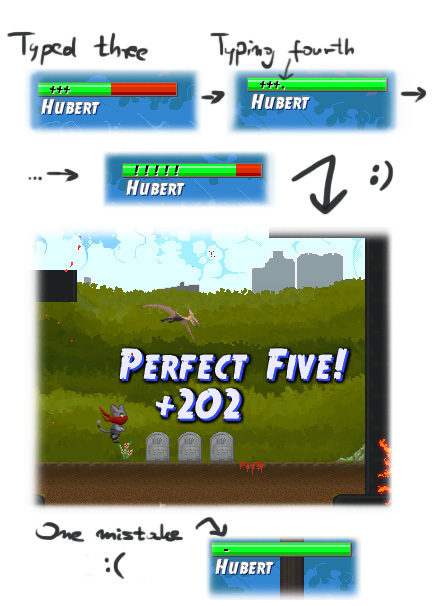 They can be combined, so if you have 3 score powerups, you’ll get 6x times more points for one kill! That’s great way of making points. However, if you’re being overwhelemed by zombie dinos, it’s better to concentrate on killing them and/or finding health, guarana or shield. Guarana from pure forests of Amazonia increases your reflexes, so that the world appears to be moving in SLOW MOTION. In other words: good old bullet time ;) It’s really helpful, especially in certain parts when you’re falling or camera is moving too quickly to type everything – then you first should collect Guarana. Shield protects from enemy attacks. With it, you’re indestructible! Beyond the obvious uses, it’s practical also when you want to type long Stars, uninterrupted. Yellow baloon is junction – typing it will change your path. It quickly moves back and forth in the direction of the new path. Junctions are completely optional. Sometimes they will be longer, sometimes shorter. Sometimes easier and other times harder. They can also show you certain funny places, almost like developer easter eggs. So if you’re playing one level more than once, it’s nice idea to change paths. You can find them in certain places of levels – sometimes only on an alternative junction road. Try to collect all stars in a level, to maximize your achievements. They have usually longer sentences (few words), so watch out for “s p a c e s” between them! Try to type the star only if you don’t have many dinosaurs attacking you (best: you have none, and you won’t have for a little more time) and you feel confident in writing the Star’s text. Remember, it’s no use to have star achievement when you’re dead. Perfect Five -i f you manage to type five dinosaurs with certain minimal word length (ie. 3 on easy, 4 on medium, 5 on hard) without making a single mistake – you get a Perfect Five, which gives instant health and score bonus. The current state is shown at the health bar, using few simple icons. Take a look at picture for visual explanation!